Congratulations to DRW’s Todd Carlisle. Our attorneys live DRW values in their non-working hours too. We’d like to congratulate Todd Carlisle, a Senior Attorney on our Treatment Facilities team on his recent award! 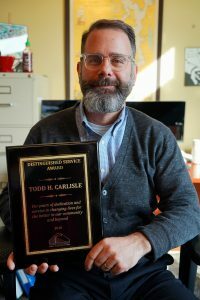 Todd was a recipient of the Tacoma Pierce County Bar Association’s 2018 Distinguished Service Award for his work as a co-founder the Pierce County Chapter of Lawyers Helping Hungry Children (LHHC). The group has organized annual fundraising breakfasts in Tacoma for over ten years, raising over $100,000 for local emergency food programs.